Opened in 1857, the park is undoubtedly one of the most famous sites in the Big Apple. Located in the heart of Manhattan, Central Park serves as the recreational area for the citizens and the city’s guests. The beautiful Yosemite valley attracts hikers, climbers and nature lovers. 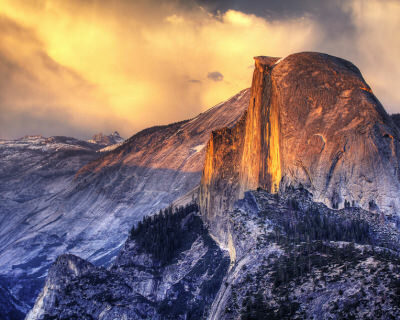 Half Dome is the most popular peak in the area, reaching 1,444 m (4,737 ft) height. And it also looks very impressive. An unusual saline lake attracts not only due to its appearance, but also for its healing powers, that are provided by the numerous minerals. One of the longest bridges in the world (10,9 km; 6,8 mi) spreads above the Florida Keys – the beautiful coral cay archipelago. Every April, on a Saturday the new road is closed for 2,5 hours for a “fun run” marathon. In Havasupai Indian Reservation, which is found in the Grand Canyon, there is a beautiful natural wonder – Havasu Falls. The site is not only a treat for the eyes, but also a refreshment for the visitors on a hot day. A unique hot spring is called after a Morning Glory flower. Morning Glory sometimes acts like a geyser: it has erupted a couple of times. The deep natural sinkholes are very often found in Mexico. Chichén Itzá’s two pits are especially beautiful and popular among the tourists, since the city itself is very interesting and worth visiting. The surroundings are gorgeous and it is possible to go behind the falls. In winter waterfall freezes and looks like a huge icicle! 20 m (65 ft) tall Delicate Arch is particularly famous for standing alone, with no rock walls surrounding it. Due to the smog, global warming and extremely hot weather during summer, the need for green areas in the cities is growing. Hopefully, the solution to exploit the roofs for planting might be a common solution in the future. Maui, Hawaii, USA. One of the Hawaiian islands is probably the most popular among tourists. With its white and black sandy beaches, warm climate and beautiful landscapes, Maui tops the Hawaiian tourism. Honokohau Falls is in Maui, Hawaii. It is certainly one of the most spectacular and unique waterfalls in the world. Carlsbad Caverns, New Mexico, USA. The caves are found in Guadalupe Mountains. The tourists primarily visit Carlsbad Cavern – a show cave, which is prepared for visitors.It is the seventh largest chamber in the world and is simply called Big Room. Karma, New Orleans, Louisiana, USA. An impressive sculpture is located in the Sydney and Walda Besthoff Sculpture Garden, which is found at the New Orleans Museum of Art. It is made by Korean artist Do Ho Suh. Horseshoe Bend is a horseshoe-shaped meander in Colorado River, Arizona. What is unusual about it, is that you can see it from the cliff above, since the Bend is surrounded with canyons. No need to fly with a helicopter to view this natural beauty. The Great Blue Hole in Belize is a great natural wonder. It is a submarine sinkhole, which lies next to the Lighthouse Reef. It is considered to be a large sinkhole: it is over 300 m (984 ft) across and 124 m (407 ft) deep. Hamilton Pool is in Texas, USA. It is 23 mi (37 km) West from Austin and is one of the most unusual as well as beautiful lakes in the world. The lake belongs to Travis County Park. Hawaii is known for its pleasant climate and sandy beaches. However, it is a collection of volcanic islands. And the volcanoes are still very active there. Since Maunaloa and Kilauea eruptions in early 1980’s, Loihi is erupting casually since 1996.